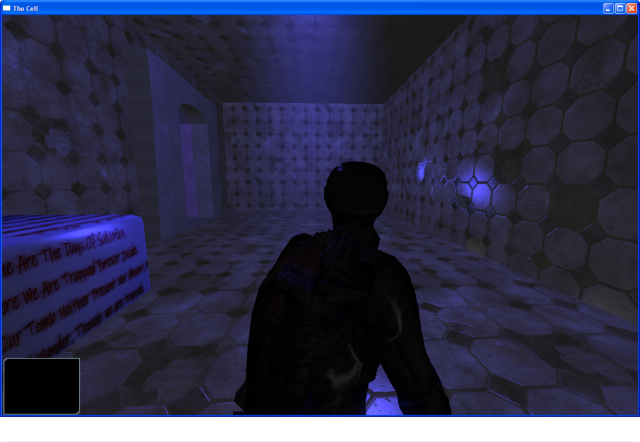 I decided to create The Cell after playing the game Penumbra by Frictional Games Link. I wanted to attempt something similar, The Cell doesn’t feature gameplay as such, it is graphical demo. The player can explore the set of chambers and find a way out, while I do have a story for “The-Cell” applying a storyline to it railroads the player and stops them from being able to freely explore. My intention is to create a second version of The Cell that is purely story driven, and maintain this version as a research platform. In order to make The Cell I had to develop a new framework to incorporate gui, state’s, menu systems event management shaders and scripting. The Cell went through a number of revisions, originally starting out on paper as a first person shooter, while I got all of this working, I found the game to be quite generic, I then rebuilt it as a 3rd person action adventure game, and much preferred it, I then removed the weapons from the game, instead favoring an exploration and adventure based approach to the game. This entry was posted on Thursday, April 8th, 2010 at 8:34 amand is filed under . You can follow any responses to this entry through the RSS 2.0 feed. You can leave a response, or trackback from your own site.